I hope your Christmas shopping is going well, I’ve barely started mine and for some reason, with 18 days to go, I’m not even panicking… I have been featuring some lovely pieces on the blog to help you guys with yours though which you can see here and here. 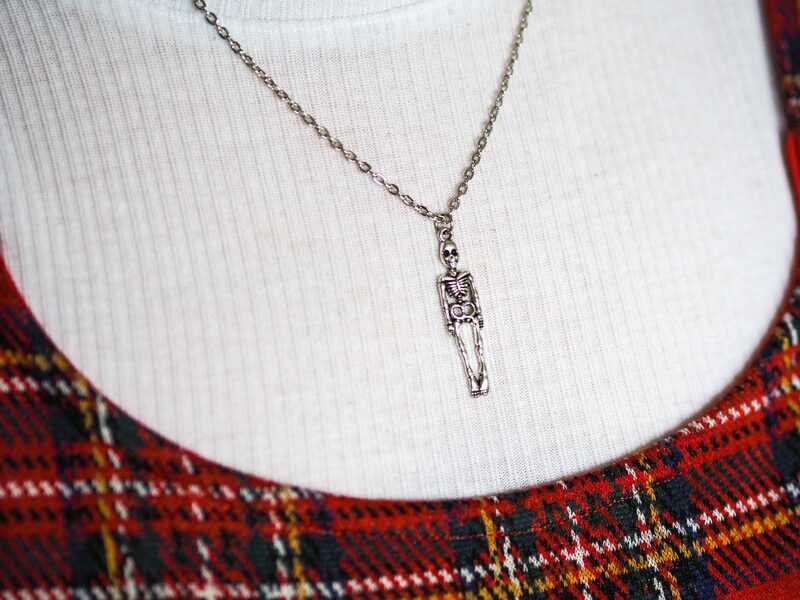 Onto todays post, I’m talking about the most adorable necklace from Statement Made Jewellery. I’m definitely one of those people with jewellery where I have my staple pieces that I wear all the time and then special occasion wear, I’m not usually someone that chops and changes my accessories daily. For this reason, I’m often much more keen on dainty and delicate jewellery for every day wear as I like simple and no fuss – who doesn’t? Although I must say, I do love chunky rings! As I’ve mentioned in recent blog posts, silver and rose-gold are my favourite finishes for jewellery. I think silver is definitely a bit more universally wearable but rose-gold is also gorgeous, classy and possibly slightly more feminine. 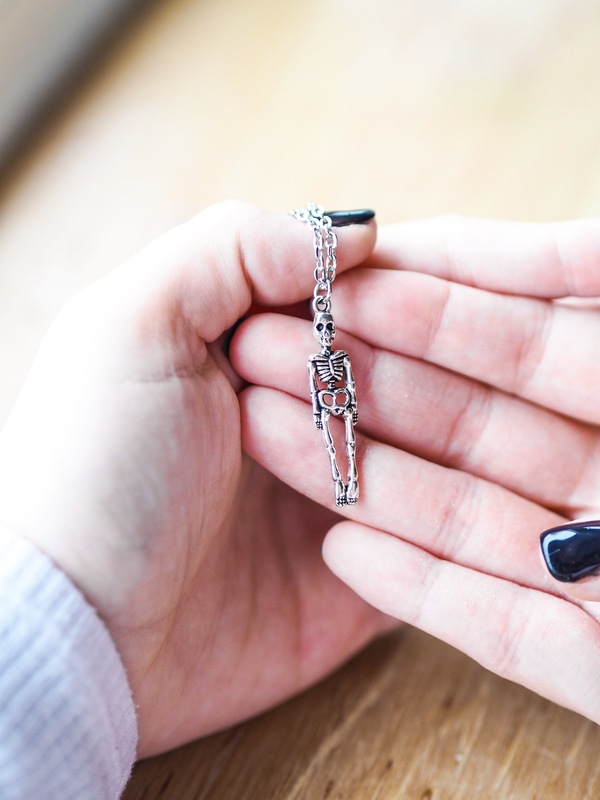 I think we all know I’m a massive fan of skulls and all things kind of creepy by now so when I received this lovely necklace from Statement Made Jewellery, I was delighted as it was everything I could want in a piece of jewellery! 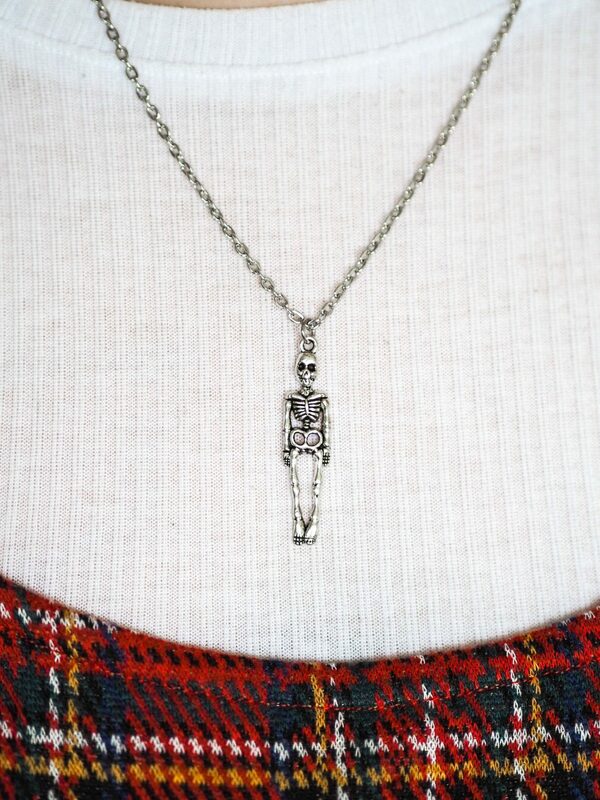 I have some skull and skeleton jewellery pieces but have never had one as dainty and adorable as this. 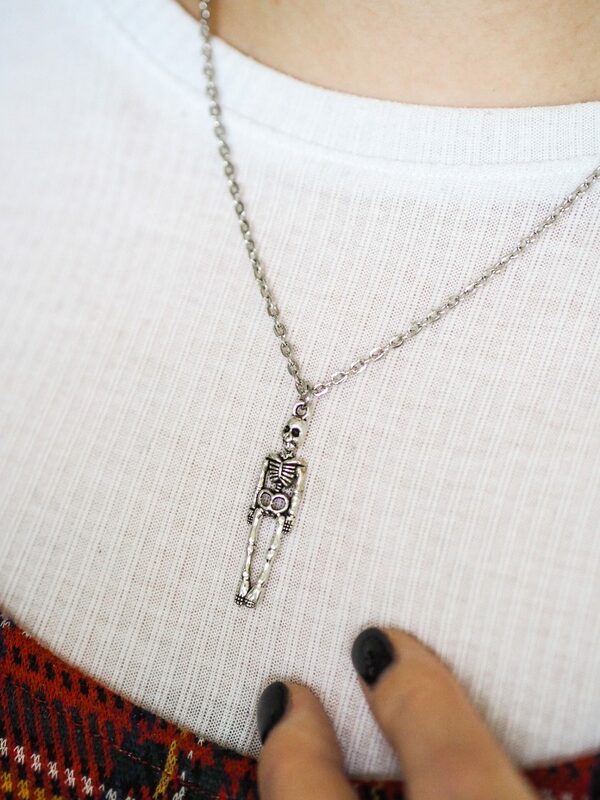 I’d say the skeleton measures around 4cm and the chain is a perfect length at 18″ for it to sit mid-decollete either loudly and proudly on top of clothing or hidden underneath an average neckline if need be. If you’d like a different length, you can also pop the company a message and they’ll be happy to personalise it for you! This piece of jewellery is sturdy, well-made from what I can gather and retails at £16.90 which isn’t a bad price at all for such a personal and cute piece. It also comes with an initial and birthstone attached with the skeleton if you’d like to add an extra personal touch. Statement Made Jewellery have a wide range of dainty and gorgeous jewellery pieces at decent prices. They’re even able to offer engraving on certain items which is really wonderful for this time of year when everyones panicking about finding the perfect gift for their loved ones. Their pieces also come in an adorable and classy drawstring bag so there’s not really much need for wrapping it up. Do you have a signature piece of jewellery? "Revamping My Routine With Rare Beauty!" This necklace is bomb as all hell. good to see how well you’re doing now! Oooh, I feel like this necklace was made for you! 🙂 I haven’t worn much jewellery for a while, but I kind of miss so I think I need to start trying again. I got sent a really cute birdcage necklace from the same company and it was so dainty and cute, this necklace you have is cute in its own way but definitely suits you!! This is super cute! I’m definitely one for dainty jewellery but also something that’s sturdy for everyday wear, because I’m too lazy to swap and change jewellery.